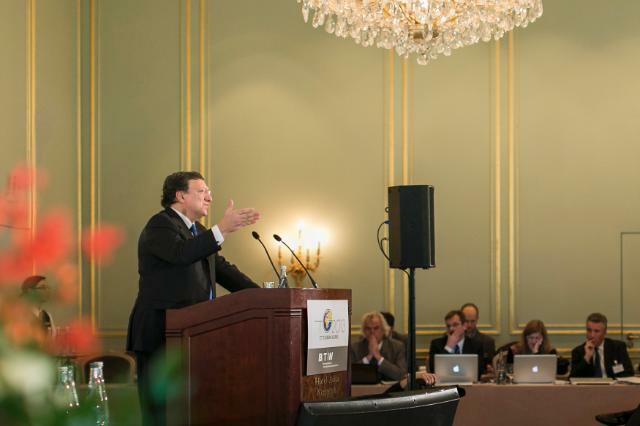 José Manuel Barroso, President of the European Commission, went to Berlin, where he participated in the 17th Tourism Summit (Tourismusgipfel). In his speech, the President reminded of the mutually beneficial effects of tourism and European integration, and underlined in particular the importance of the four freedoms of the Single Market for a flourishing tourism sector. (EC Audiovisual Services). With Brussels ‘digesting’ two historical developments, the annexation of Crimea by Russia and the creation of the European Banking Union, this new week predictably could be rather quiet. There is a problem though the Commission will try to resolve during the next few days. It’s the EU Schengen visa applications by non EU citizens, who want to take their summer vacations in southern Eurozone countries. Spain, Greece, Italy and Cyprus depend heavily on Russian and Ukrainian holiday makers, in order to boost the potential of their tourism industry. Understandably, the deterioration of EU-Russia relations and the political developments in Ukraine could compromise the south European summer holiday season. Almost one fifth of the Greek GDP comes from the tourism sector. To a lesser degree, all south Eurozone countries depend on tourism in order to gain a sustainable growth path. Despite efforts in recent years, the amount of red tape and practical difficulties facing those who apply for an EU Schengen visa are substantial. Difficulties include long waiting times in some areas of the world, and complex requirements for supporting documents. On 19 March, the European Commission put forward a visa package introducing facilitations in the processing of Schengen visas: (1) Clearer and shorter deadlines and easier lodging of visa applications; (2) Easier issuing of multiple-entry visas; (3) A new type of visa allowing those who intend to travel around Europe to stay longer than 90 days in the Schengen area. Next Tuesday 1 April the Commission will present its initiative to facilitate the issuance of Schengen area visa for third country holiday makers. A 2013 study on the economic impact of short stay visa facilitations on the tourism industry gives an idea of the economic benefit. The findings show that, by introducing various procedural facilitations, an increase in trips to the Schengen area of between 30 and 60 % could be expected. Visas are issued for the entire Schengen Area. Once within it, business people and tourists can freely circulate without being subjected to border checks. Since 1985, the Schengen Area has gradually expanded and today encompasses almost all EU States and a few associated non-EU countries like Switzerland. While having abolished their internal borders, Schengen States have also tightened controls at their common external border on the basis of Schengen rules to ensure the security of those living or travelling in the Schengen Area. This tightening of the visa issuance procedure has undermined the tourism industry potential of south EU countries. To mend this unwanted side effect the Commission proposed the introduction of a new visa code. Since the entry into force of the new Visa Code in 2010, it has facilitated legitimate travel and tackled irregular migration, by improving consular organisation and cooperation, strengthening procedural guarantees, and reinforcing equal treatment of visa applicants. However, more should be done to address the challenges faced by visa applicants and Member States’ consulates. Given the developments in Ukraine and the annexation of Crimea by Russia, this year the visa issue takes a new dimension. The usual red tape may trigger a negatively exponential reaction by the Russian holiday makers at a great cost to south EU countries. That is why the Commission is about to propose this Tuesday 1 April “more flexible visa rules to boost growth and job creation”. On the same day a Press conference with Vice-President Tajani and Commissioner Malmström will take place and there will be a technical briefing with experts from Commission’s Directorate General HOME. A large part of the GDP of the crisis hit south Eurozone countries’ depend on the success of this Commission effort, to facilitate the issue of visas for non-EU holiday makers.